Dr Pip Wallace is convenor of the environmental planning programmes at Waikato University. 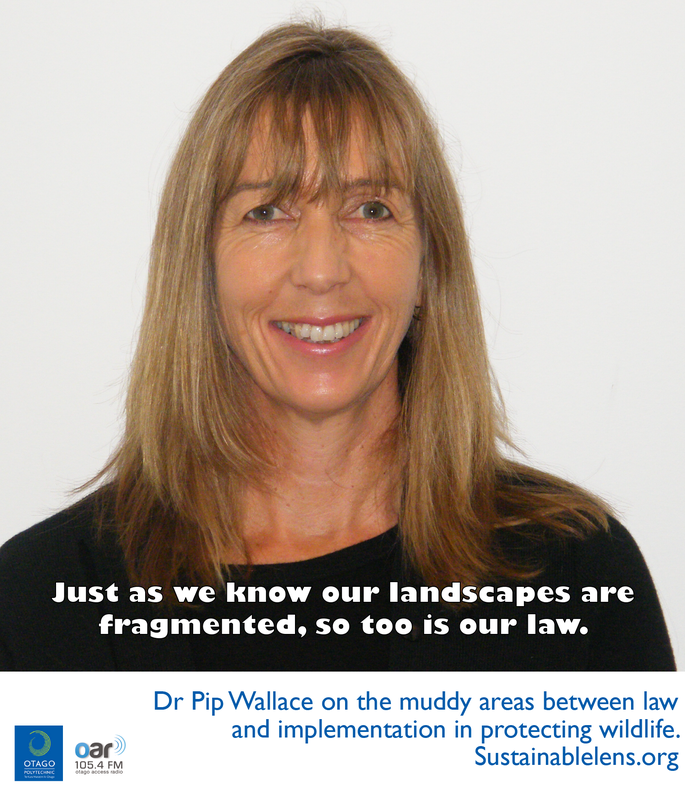 We ask her why she has described environmental law as a fragmented landscape. Often there is not careful recognition of the environment’s rights. A lot of the work I’ve done recently looks at how the law works to distribute harm and benefit to non-human aspects of the environment. The definition of the environment at law is huge – it involves people and communities as well. There are core frameworks, some of which have core principles – resource use and how far you can go, but in my mind they are a bit weak in terms of protecting the environment. (How does law cope with the complexity of the environment?) Recent work that I’ve been doing suggests we’re not dealing with it very well in a range of areas. I’ve come to the conclusion that we have problems with the level of standard that we apply in terms of protecting the environment, we have real problems with being consistent across environments and across species. We also have considerable difficulty in implementing what we say we intend to do. This is especially problematic for fauna moving across a fragmented landscape. Law relies on scientific definitions, but has great difficulty with topics such as resilience that have a clear scientific definition but has been transposed into socio-cultural areas as well, the word becomes used in different ways. Same for ecological integrity…sustainable management. Wildlife Protection Act, absolute protection from direct harm…but premise diluted by how the law is constructed and applied. There’s a very muddy area related to incidental take – a poor intersection between the Resource Management Act and the premise of absolute protection in the Wildlife Act. The law suggests they should be protected, but the implementation is not good in New Zealand. The Resource Management Act…sets out a framework in relation to all resources. The Resource Management Act was ground breaking…it followed a philosophy of integration. Prior to that a lot of our law was in pieces. It came into being along with the understanding about the interconnection of our resources, and that you can’t direct deal with these things in isolation. The law was designed to reflect the interconnection of resources and nature – dealing with all aspects at once, together. This was clever – a good thing to do. It was also governed by the purpose of sustainable management – which introduced the idea of environmental limits. Again, very progressive and good. There are attempts to weaken the Act now, I find that frankly hard to understand. Why you would ever need to weaken the environmental protection provided by the RMA when in my view it is insufficient. Around 5% of resource consents are notified, below 1% are declined. Instead what we are seeing is intensifying and increasing loss of biodiversity, increasing numbers of threatened species and an increasingly degraded environment. To strengthen the RMA, we should be more robust about enabling coexistence. How we deal with avoidance of effects is not very brave. Spatial effects such as corridors are not well managed by law. Wildlife property of the crown, it is seriously struggling to manage its property. Mobility in the past was a survival strategy has become a liability in the anthropocene. (Kakapo versus petrel). Life can be hard – we should always try. We are not applying precautionary principles with sufficient active intent. I believe that if we plan and conserve the environment then we’ll have a better chance than we do currently. I think it is the belief that we can have access to everything that is driving the problem. We need to look at our patterns of consumption and the way we use resources and consider what it is we wish to leave for our future generations. I’m sure we will be viewed as a very profligate generation, I’m sure that people will look back and heap shame upon us for our inability to control our consumptive choices. We are all responsible for that. We shouldn’t say “it’s a wicked problem, there’s nothing we can do about it”, I think we need to affect change sooner and be more thoughtful about the choices we do leave our children and grandchildren. We are driving production because we are buying it. Should future generations have access to pristine resources? People who are environmental planning…genuinely interested and engaged in a sustainable ethic and wanting to make a difference. But room for a range of perspectives. (Challenges?) Persevere with improving systems to work better to do what they are supposed to do. (Advice?) It is incumbent upon us to be positive about our world.